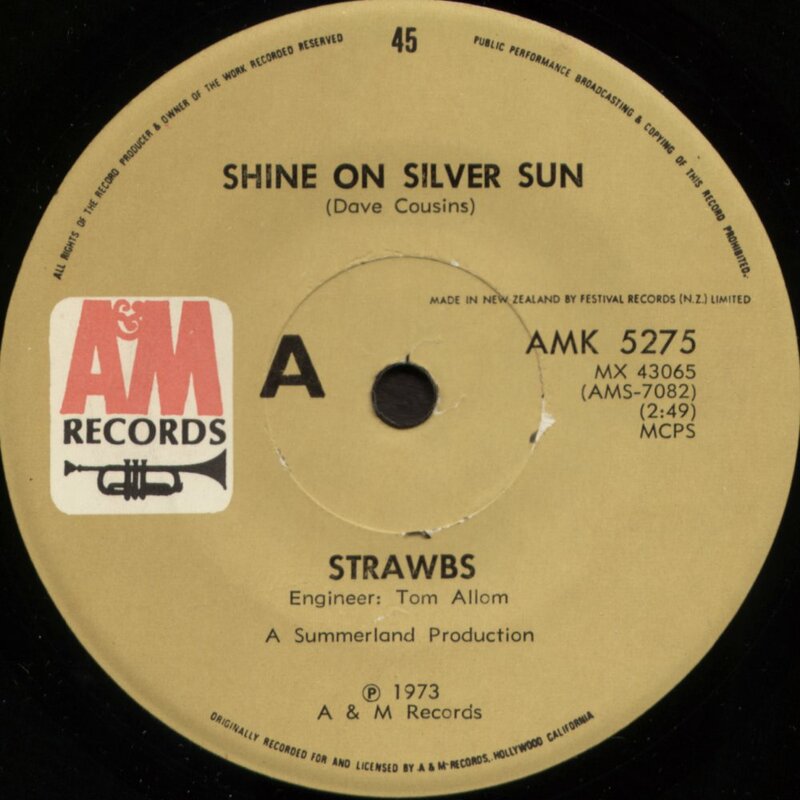 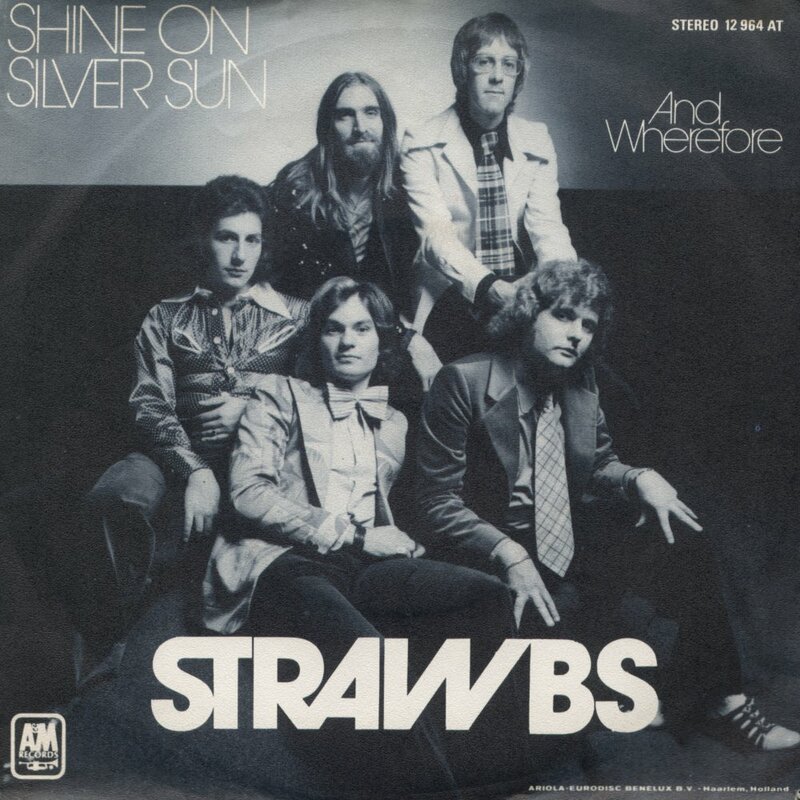 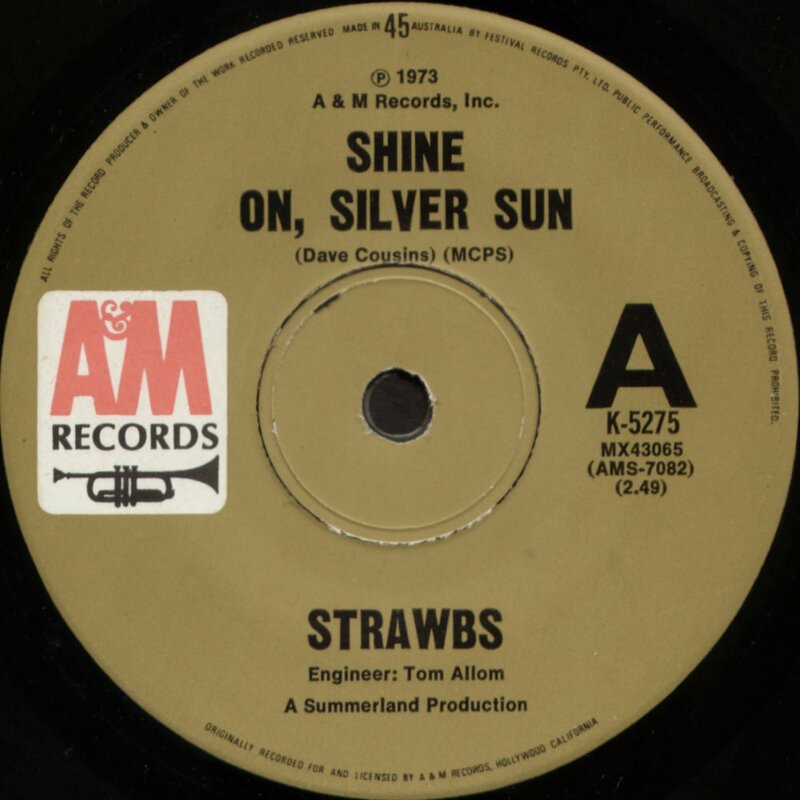 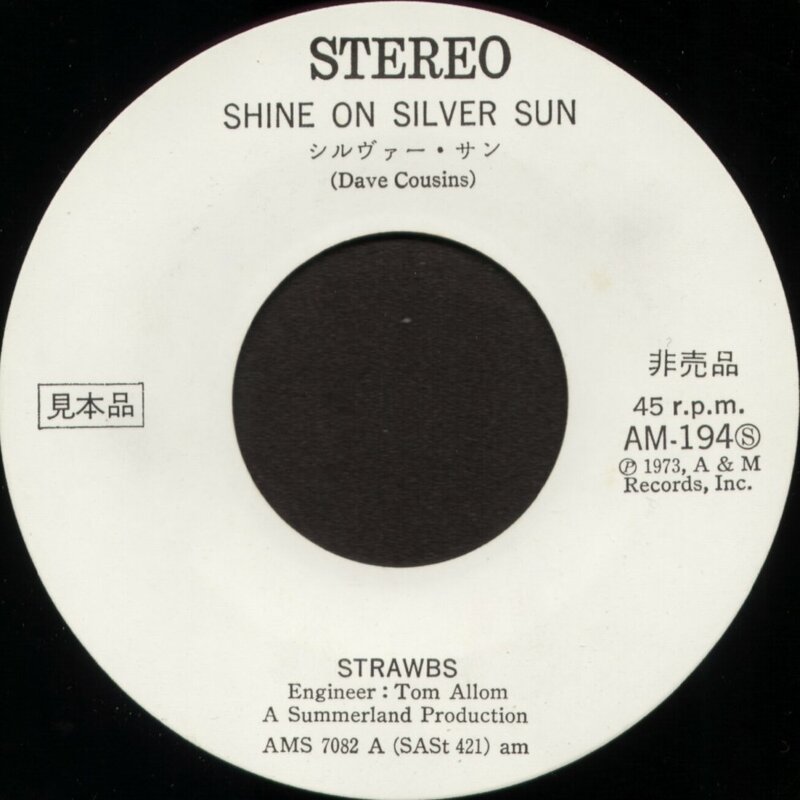 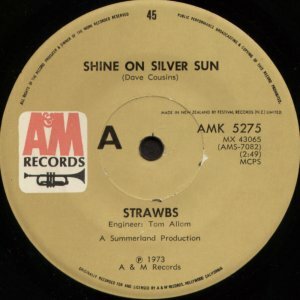 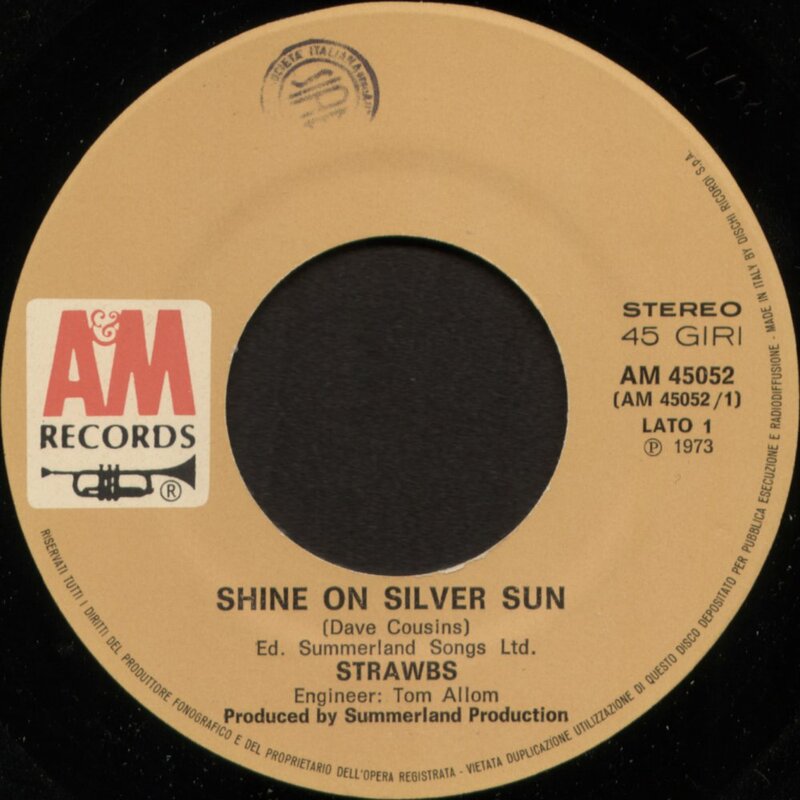 "Shine On Silver Sun" was the Strawbs' comeback single after the disastrous break-up in Summer 1973. Dave took the new crop of band members down to Devon to work up new songs and existing material, then, as often was the case, into the studio to record a few numbers for possible single release. 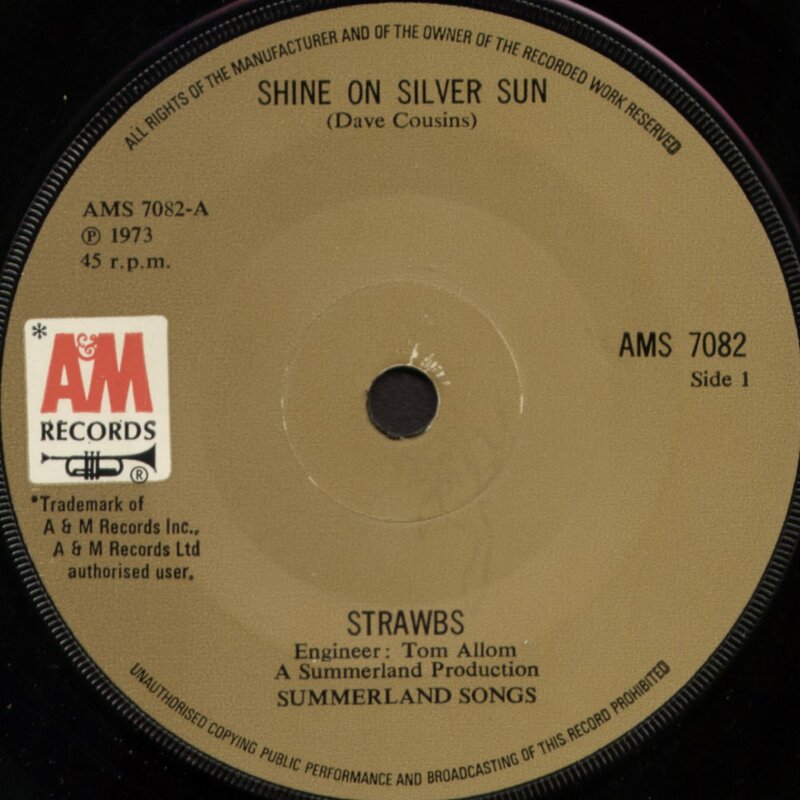 Recorded at the same time were "Just Love" (an old Dave Lambert/Fire number), "Where Do You Go (When You Need A Hole To Crawl In)" which made the B-side of "Hold On To Me (The Winter Long)". The other track recorded then was probably the mini-epic "Why And Wherefore". 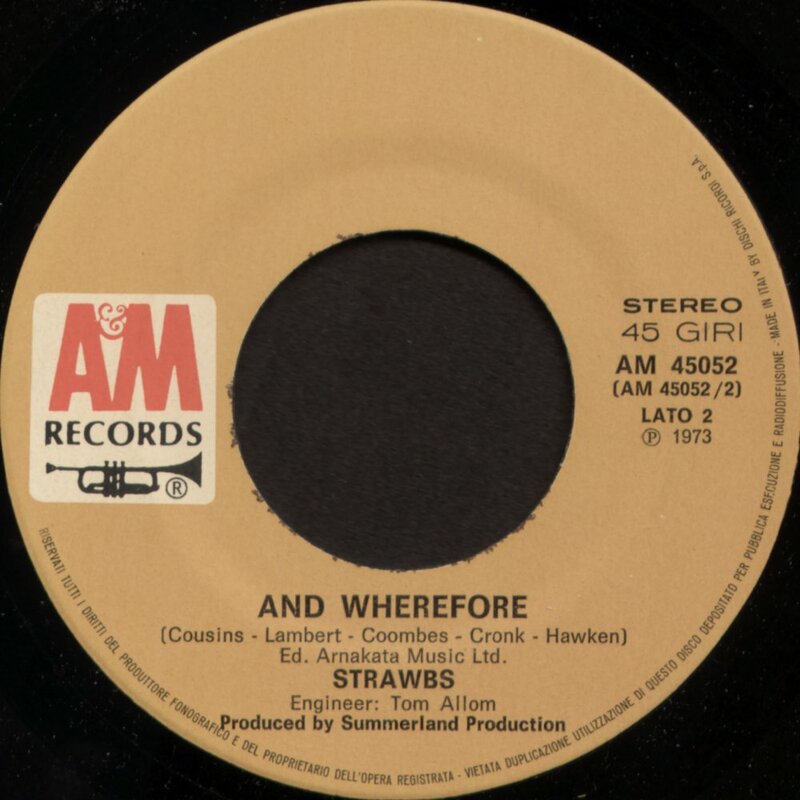 This was in three parts - "Why", an old Cousins number (check out the early version on Preserves Uncanned) and "And Wherefore" with a short bridge in between. 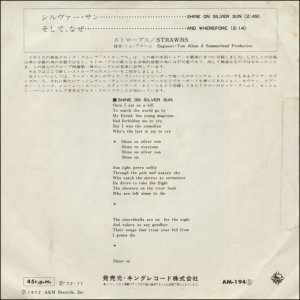 For some time this was only available in live format on the In Search Of The Heroine" bootleg, but the studio version was included on the UK Halcyon Days 2CD set. 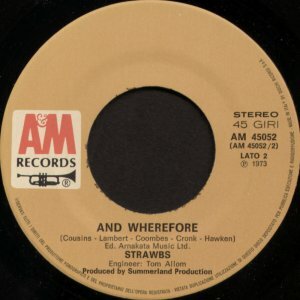 The version of "And Wherefore" which appears here is different however, with a long harmonica break (played by Lambert ?) instead of the (for once, not very impressive) electric guitar solo on the full studio version. 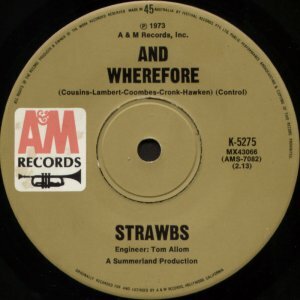 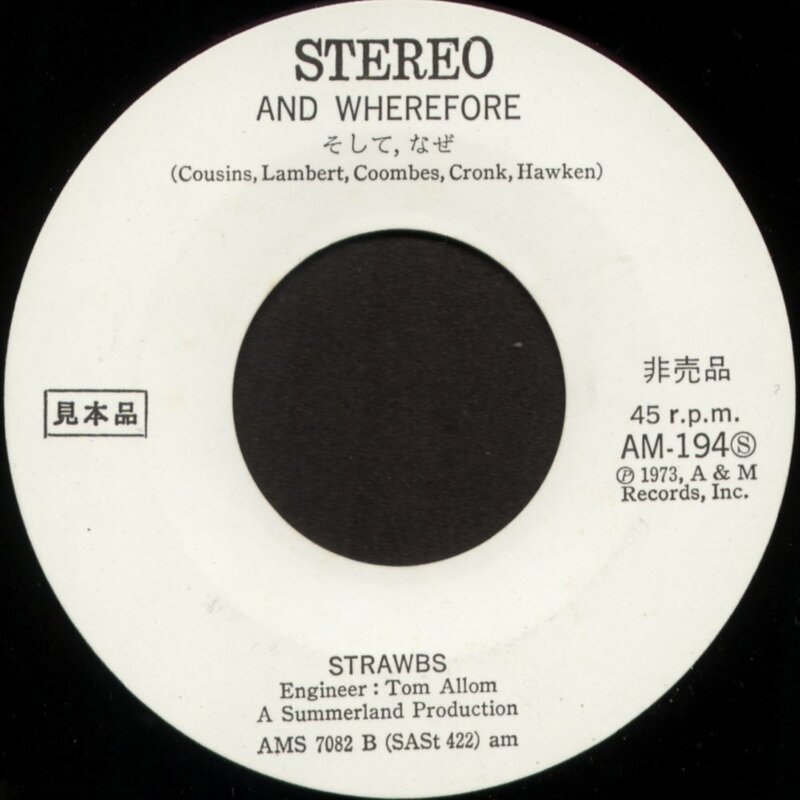 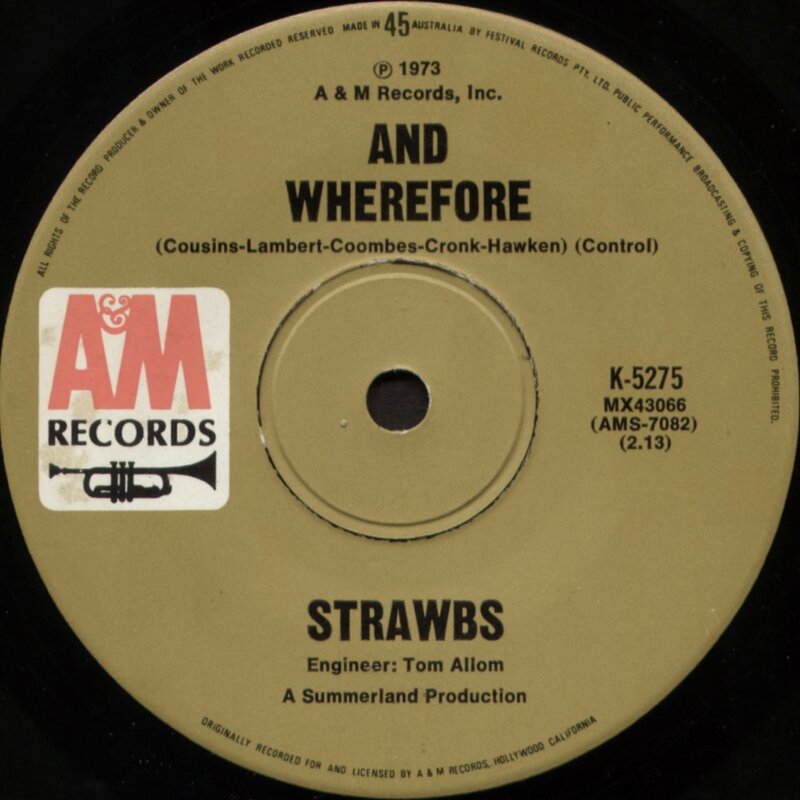 So, either the single version was recorded and then merged with other fragments during the album sessions to make up "Why And Wherefore"; or the single version was an alternative take from those early sessions. The title suggests the latter. 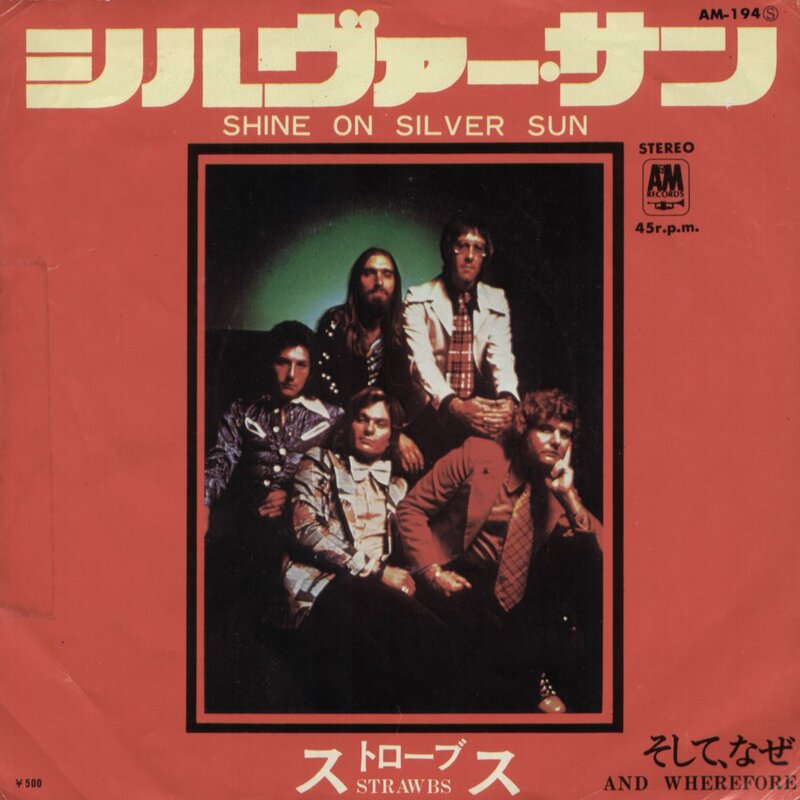 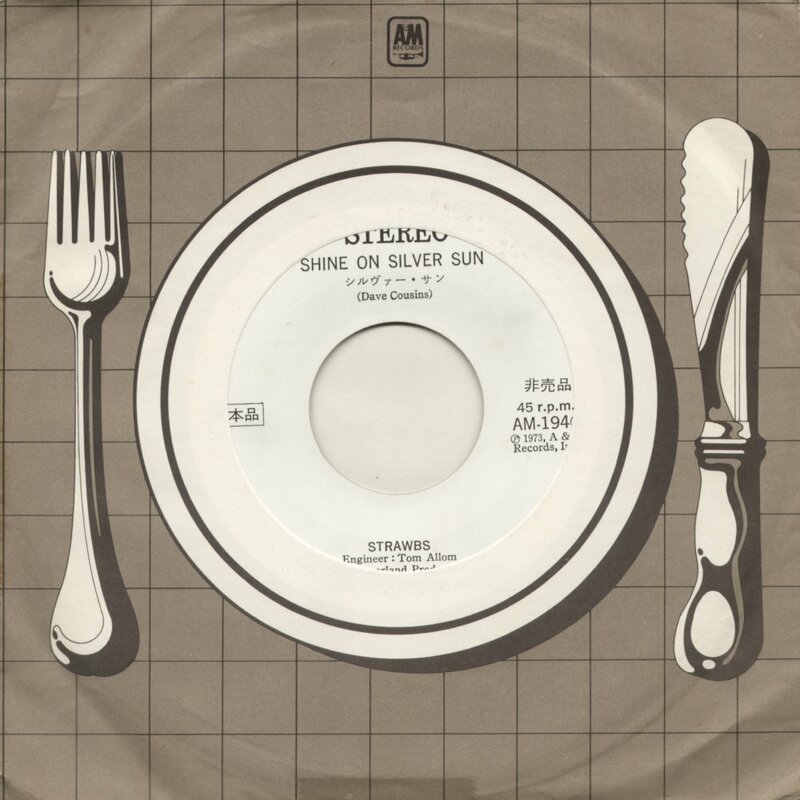 "Shine On Silver Sun"/"And Wherefore"
The UK release was scheduled for 31 Aug 1973, but was delayed a week to 7 Sep 1973 - the promo singles were hurriedly stickered to reflect the new release date. 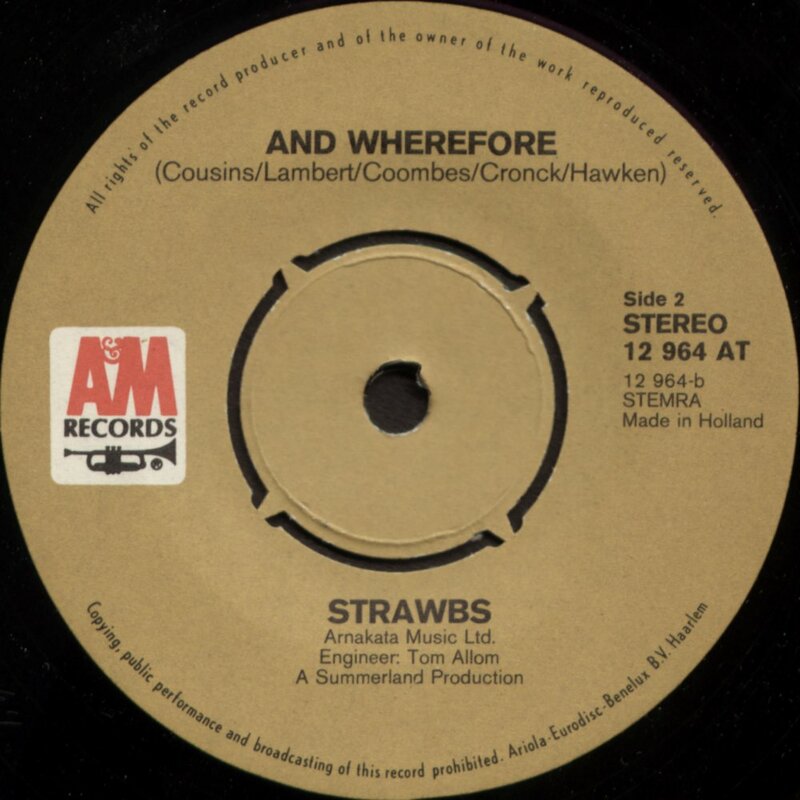 The new look Strawbs performed the song on Top Of The Pops and the single made 34 in the UK Charts, but failed to repeat the runaway success of "Part Of The Union". Not known where this comes from - it was advertised for sale from Macedonia, but seller no longer had it and sent standard UK release instead. It is very very similar to the UK release and may have been a UK mis-press. 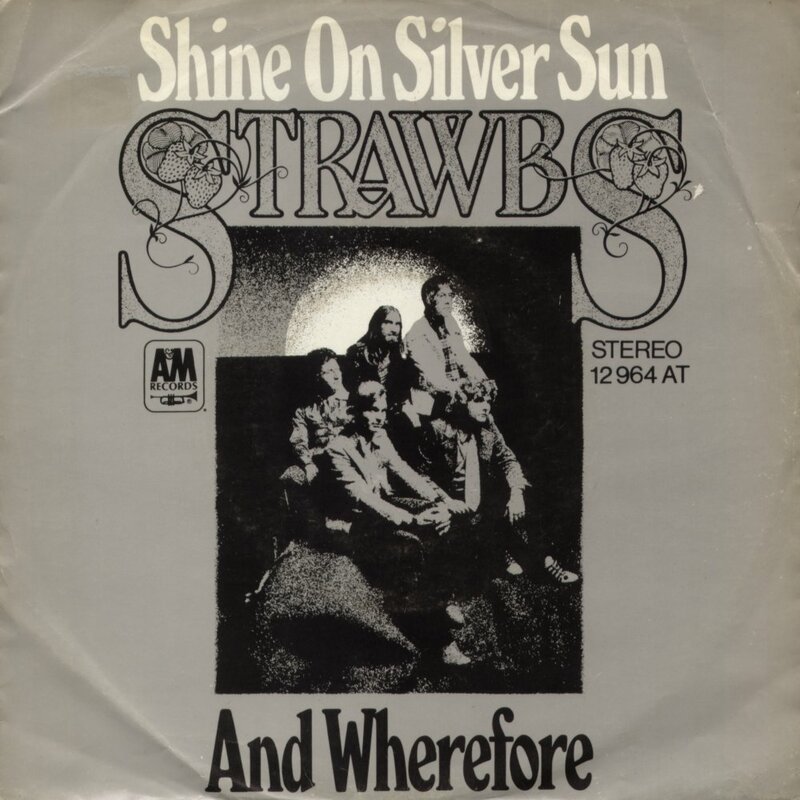 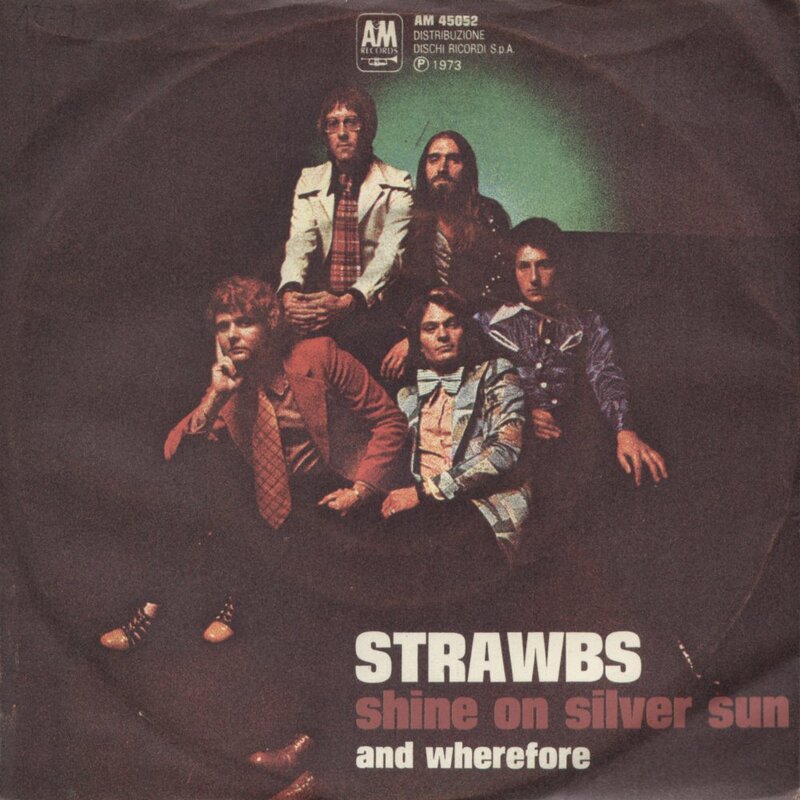 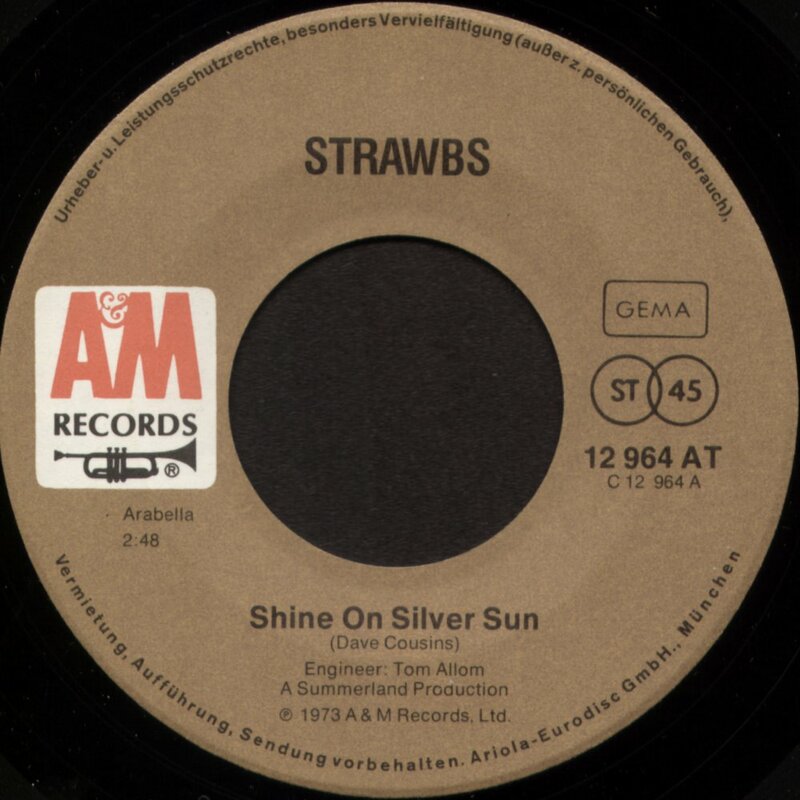 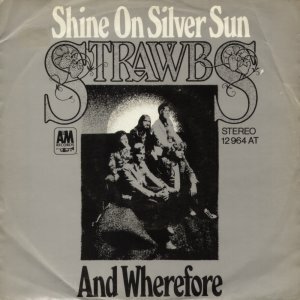 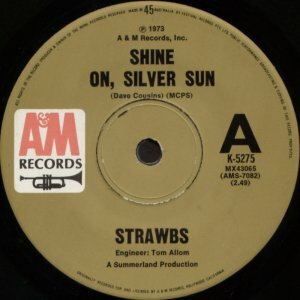 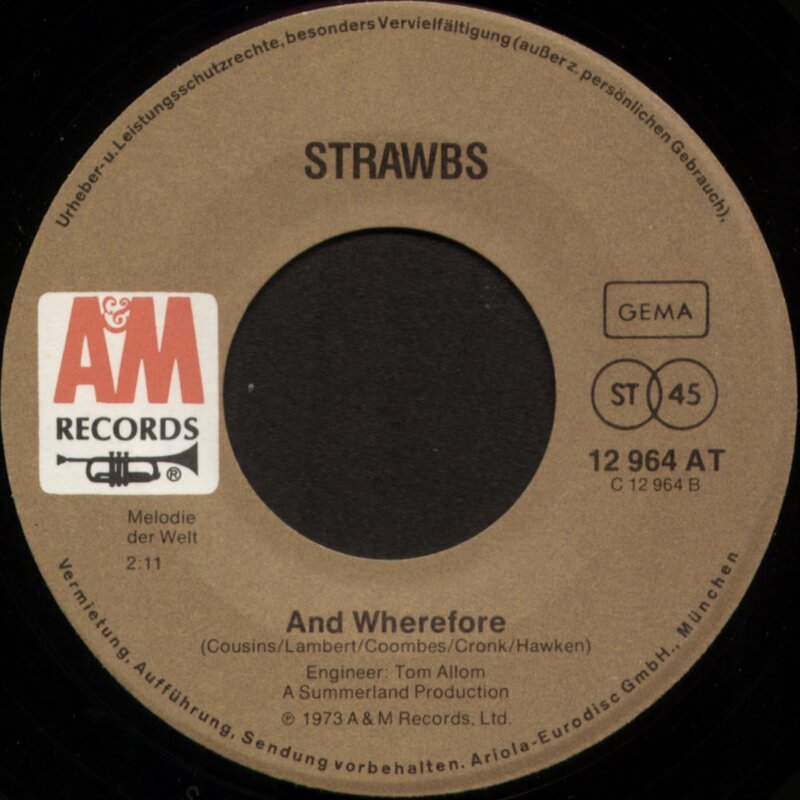 "And Wherefore"/"Shine On Silver Sun"
The website On A&M Records lists this with the B-side first, with a US release catalogue number and 1973 release date. 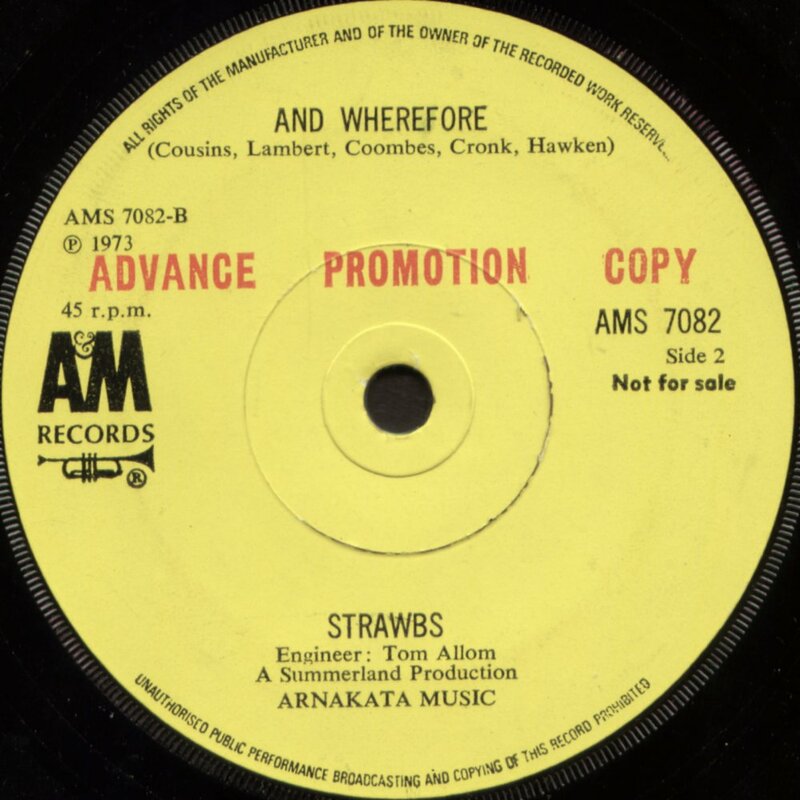 Never seen one so it may not have made it out the door. 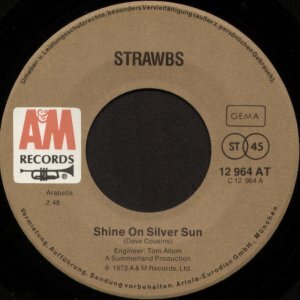 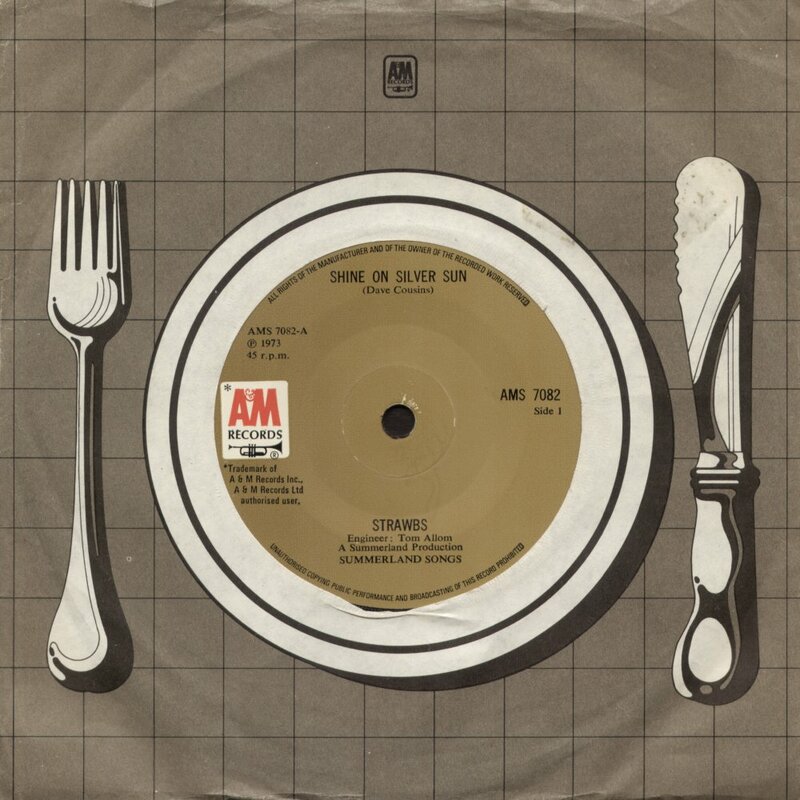 Haven't ever seen any trace of a Canadian release of "Shine On Silver Sun". 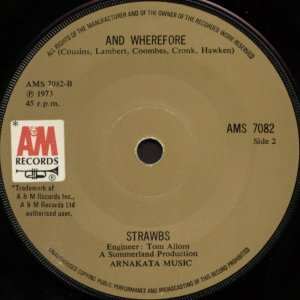 Anyone seen one? 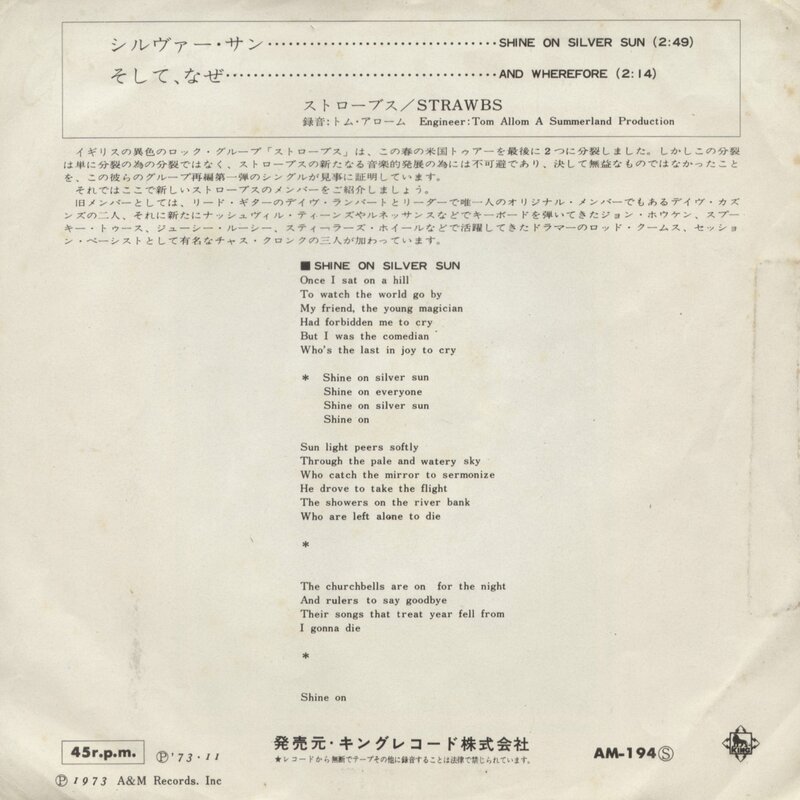 Rather dull grey cover, plain grey on the back. 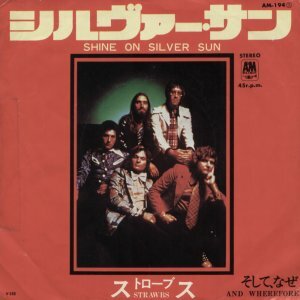 Same label number as the German release, but a more attractive cover, featuring the first promo photo of the new band, artfully arrayed in various posh jackets and ties (nice shoes too!) on a rather uncomfortable-looking podium draped with dark cloths. The picture was used for a splendid display poster, which I got from my local record shop when they'd finished with it, and went straight up on my wall for about 10 years! 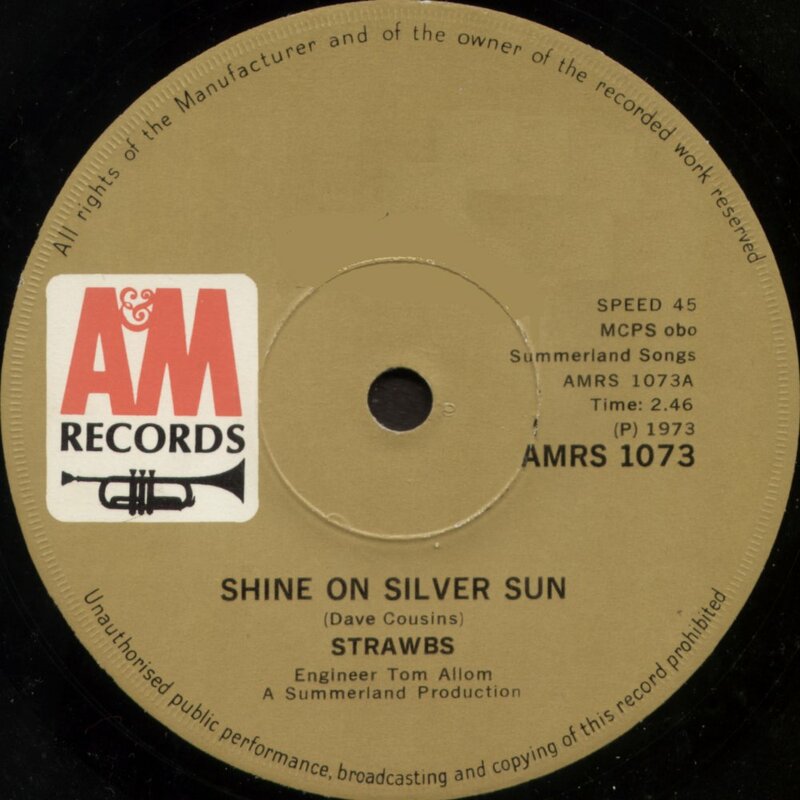 The cover of the single is the same on both sides, except for some wording (which also appears on the sleeves of the Dutch releases for "Shine On Silver Sun" and Hudson Ford's "Pick Up The Pieces") - "hoes: arno van ofsouw - amsterdam" (cover/sleeve by ..... ). 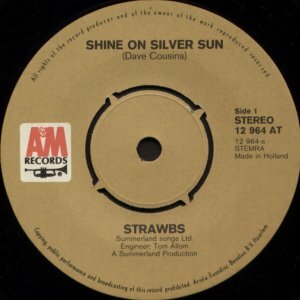 Van Ofsouw was a prolific graphic designer in Netherlands - look him up on Discogs! 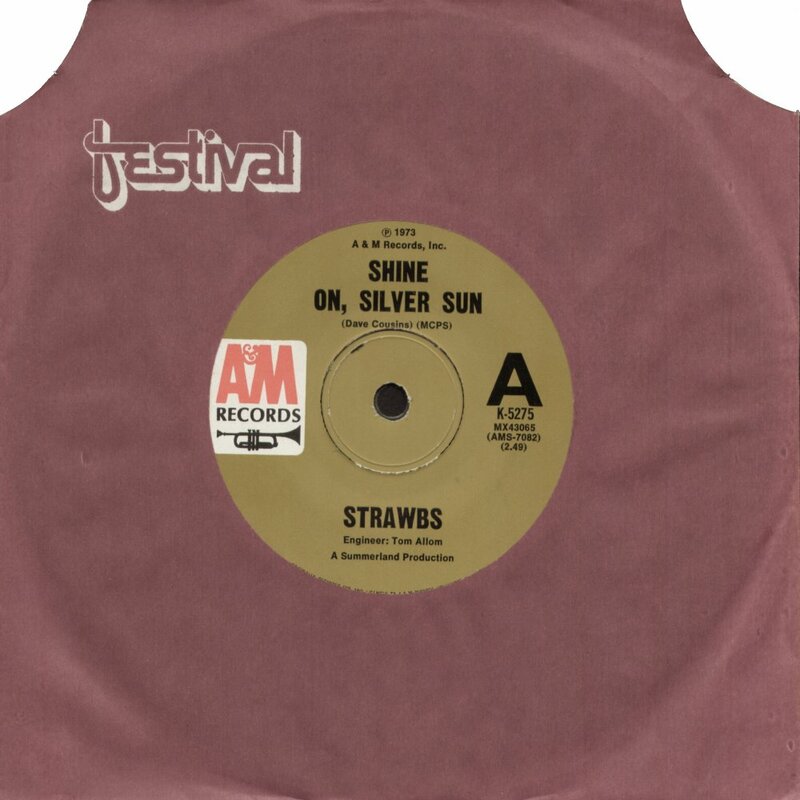 A very similar, though not the same photo as used above, further adapted by printing it the wrong way round! 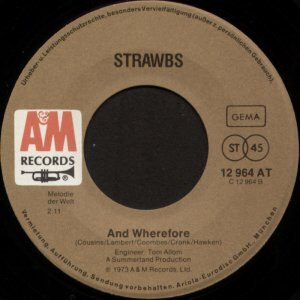 Any sign of a Danish version? 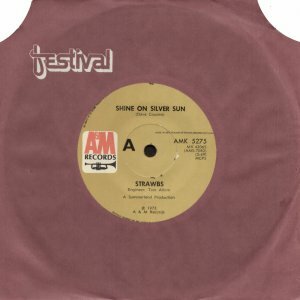 Festival Records had the Australian franchise for A&M. 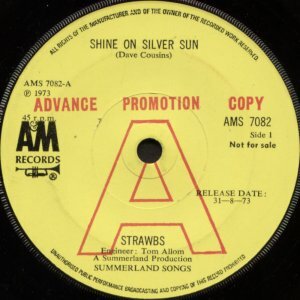 A plain release from New Zealand. 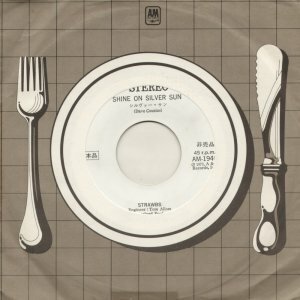 A white label release with an insert and a "plate setting" King Records company sleeve, as well as a plain white sleeve and protective plastic sleeve. Did this release make it beyond promo status? 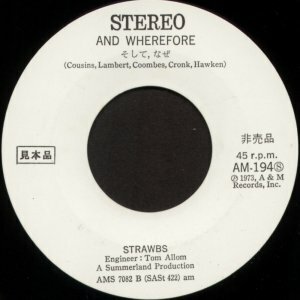 Anyone got one?